Many people think of coconut as a ‘nut’, but it is a fruit. For generations, Indian homes have been using coconut as an offering to God and in cooking. People who believe in the power of nature, must be aware about the benefits of coconut for health. Coconut plant is widely distributed around the tropical regions of the world. The inner raw coconut meat is loaded with plenty of vitamins and minerals and other health-promoting compounds that are essential for a good health. It is also known as ‘the fruit of life’ due to its various nutritional, health and economic advantages. However, many people still think of coconut meat as an unhealthy food because of its high fat content. The health benefits of coconut meat include its beneficial effects on heart, skin, brain, and stomach. It supports heart health, fights off infections, delay aging, and improves skin health. It is used for the treatment of gastric ulcer, burns, wound healing and Alzheimer’s Disease. Each of these compounds possess different medicinal properties, that promote good health and protect against infections and diseases. The coconut meat is further a rich source of protein, fat and dietary fiber. People believe that consumption of coconut is associated with hyperlipidemia and heart diseases, but studies have found that the above-mentioned health problems are uncommon among high coconut consuming health populations. Raw coconut meat contains fat in the form of saturated fatty acid, which is atherogenic. Unlike other saturated fats, the fat present in coconut is medium chain fatty acids. These medium chain fatty acids are broken down faster and are not stored in the body like long chain fatty acids. Thus, it does not contribute to high cholesterol levels and does not increase the risk of heart diseases too. Free radical damage is believed to contribute to a variety of health issues including, heart diseases, uncontrolled blood glucose levels, cancer, arthritis and premature aging. The presence of ascorbic acid and flavonoids in appreciable amounts in coconut meat is largely responsible for its antioxidant property. Coconut has been identified as a potential cognitive strengthener. It is a rich source of medium chain fatty acids, which are converted to ketones in the body. Ketone bodies are a vital alternative source of energy for the brain, which may be beneficial for individuals with memory impairment, as seen in Alzheimer’s disease. Amyloid plaque is the hallmark of Alzheimer’s disease. These plaques get accumulated between the neurons present in the brain. This causes degeneration and death of neurons, which further has a negative impact on cognition. Studies have demonstrated that consumption of raw coconut meat improves diabetic indicators. This is possible due to the presence of protein in it, particularly arginine. Arginine enhances the production of pancreatic beta-cells, which are the main producers of insulin. It further boosts insulin release, which helps in the better control of blood glucose levels. 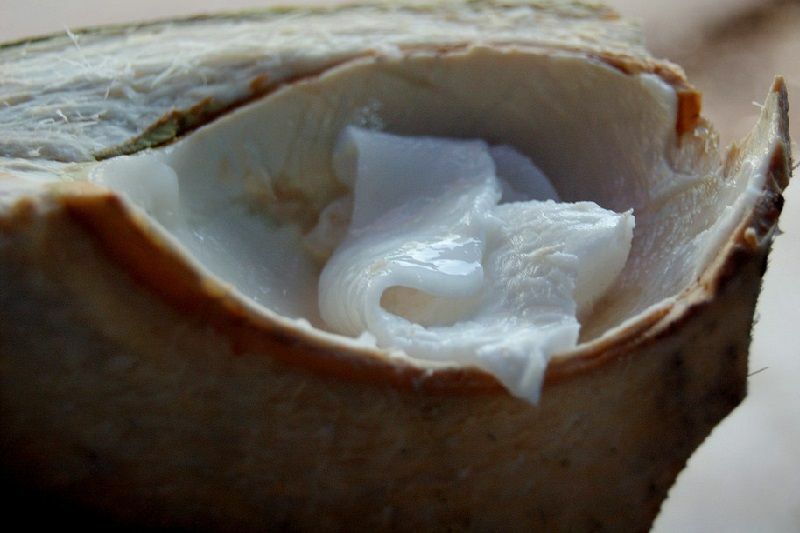 Raw coconut meat is a rich source of dietary fiber. Eating such a high fiber food slows down the release of glucose in the blood and thus, it prevents spikes in the blood glucose levels. Coconut is a cost-effective and a natural treatment for gastric ulcers. It is an excellent anti-inflammatory, antioxidant and anti-ulcer agent. Consumption of coconut meat reduces the size of the gastric ulcers and helps in its clearance. Coconut is an anti-inflammatory agent, it suppresses the production of pro-inflammatory compounds and reduces the overall inflammation, which otherwise aggravates the condition.